The Tourist Office is perfectly located on the edge of the city centre near the old town, pedestrian streets, Porte Jeune car park, the tram and train lines. See inside Mulhouse Tourist Office as if you were really there! The idea behind the premises is to provide visitors with somewhere they can feel comfortable and have a new Tourist Office experience in a “living room” with sofas, sun terraces, play area with games and toys, iPads available to use, free Wi-Fi, pamphlets to read and take away etc. The Famille Plus and Tourisme & Handicap approved Tourist Office is equipped to ensure everyone can have an enjoyable experience and get the advice and information they need. It is also an exciting space to explore where you’ll find gift ideas to treat yourself and loved ones! 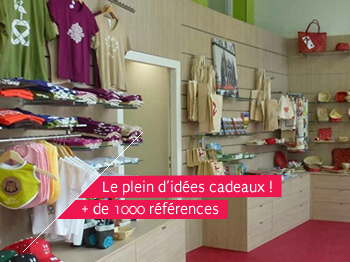 With almost 1000 products, the shop sells wine, beer, pains d’épices and foodie gifts as well as books, IGN maps, souvenirs, Mulhouse crafts, unusual items created especially for us, a textile range with numerous Alsace designs and more. Your one stop shop to take a piece of Alsace home with you. Do you need advice and information? Do you want to book a show or guided tour? Do you want to relax in our peaceful and friendly setting or have a coffee on our terrace? Come and see us, that’s what we’re here for ! January, February: 10am-1pm / 2pm-5pm Monday through Saturday. Closed on Sundays et January 1st. March to June, September to December: 10am-1pm / 2pm-6pm Monday through Saturday, 10am-1pm on Sundays and French bank holidays. Closed on May 1st, December 25th and 26th. July and August: 9.30am-6.30pm Monday through Saturday, 10am-1pm on Sundays and bank holidays.